Tax-free savings accounts can help you save more for the long term because you don't pay tax on the growth of your investment. There are quite a few providers that offer these types of investments, so where do you start? What are tax-free savings accounts? You can save between R500 and R2,500 a month in a tax-free account up to a maximum of R30,000 each year and up to R500,000 in your lifetime. South Africa has one of the worst savings rates in the world; in fact, the majority of South Africans end up depending on family and the government for financial support when they retire. This initiative is similar to many other products that governments from all over the world are using to incentivise consumers to save. There are some tax deductions and exemptions in place on interest, dividends and capital gains, but depending on how high the interest or capital gains are, you may benefit more from a tax-free savings account, depending on the returns you earn. Because you don't pay tax on your original investment or on your tax-free returns, you can maximise the power of compounding - which is the growth on your growth. Another benefit is the flexibility to stop your contributions at any time if you cannot afford the monthly debit order. To get a better understanding of how a tax-free savings investment can benefit you,benefit you,consider the comparison on the left of someone saving R2,500 per month for between 10 and 40 years - stopping contributions when they reach the lifetime limit of R500,000 and leaving the money in the investment vehicle thereafter for compound growth. It is clear that a TFSA can be a great way to save for the long term when compared to other savings vehicles. Please note that the Retirement Annuity balances shown assume that you annually re-invest the tax saving offered by an RA upfront. You will shortly be able to use calculators on beanstalk.co.za, where you can enter your specific details for a personalised view of how a tax-free savings investment can benefit you. One of the myths about tax-free savings accounts is that the flexibility to withdraw money at any time is a key benefit. Although this is technically true - you can make a withdrawal, and there are no exit penalties - it is not to your benefit since it will seriously compromise your savings goals and tax savings. You won't get the full benefit of the product if you make withdrawals. You need to be disciplined and keep your money in the account to make the most of the tax saving and compound growth. These products won't keep up with inflation, which means the value of your investment will actually decrease over time. Although cash is the safe option, you need to take on some risk and stomach some fluctuations in your investment's value to beat inflation and grow your money over the long term. High risk products can lead to greater capital losses - choose your underlying investments well and get professional advice about this if needed. 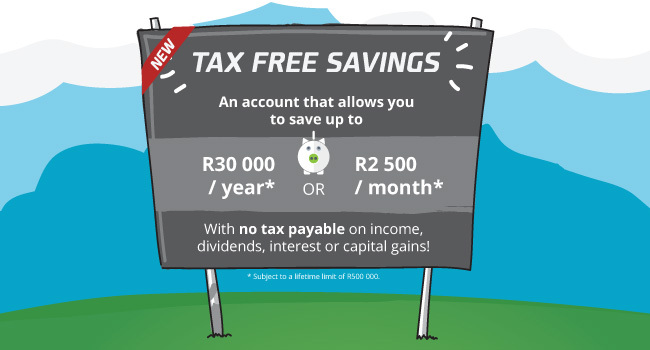 If you save more than R30 000 per year in a tax-free savings account, you will be taxed heavily. Based on certain criteria such as fees, flexibility in investment choice and ease of administration, Beanstalk have selected a product they feel offers the best value for your long-term savings. It is available on the Beanstalk platform and is administered by Investec Management Services. In addition to saving you the time and effort of doing the research and sifting through all the products on the market, Beanstalk has also simplified the investment process. There is no hassle, minimum frustrating paperwork and you can do this in the comfort of your home when it suits you. Investing in a tax-free-savings account involves 5 simple steps and only 20 minutes of your time. Sign up at try.beanstalk.co.za or contact us for more information. Decide how much you would like to invest. The minimum is R500 per month. Choose your underlying funds, including index-linked, offshore and low risk balanced funds, with guidance provided by Beanstalk every step of the way. Some funds will be more suitable for you than others, and depends on your savings goals and risk profile ? we will help you choose if you are not sure. Complete the forms online. It should only take you about 5 minutes. Sign the forms electronically with secure e-signature software and upload your FICA documents to complete the investment. Beanstalk will thereafter monitor the investment and communicate regularly with you to update you on how your investment is doing. We use tried and tested technology to ensure that you have peace of mind about your money, and partner with big brands like Investec, Coronation, Foord and Allan Gray when it comes to underlying investment options. 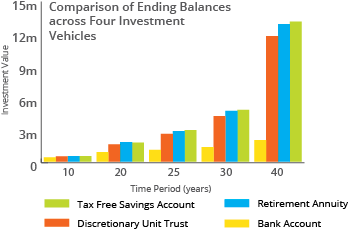 The potential tax saving benefit of the tax-free savings account is clear, but the exact outcome and extent of the benefit will ultimately depend on your personal savings goals, investment time horizon, and capabilities. To get the peace of mind that you're making the best choice for your financial future and to get answers to all your 'what if' and 'yes but' questions, you can contact us for professional, independent and obligation-free advice.